Distrust of the mainstream media has reached historic lows as polling organizations across the board show that an overwhelming majority of Americans do not trust the MSM to "fact check," according to Rasmussen. The media is in the bottom four in institutions trusted by Americans according to Gallup. Emerson just found that Americans trust the Trump administration more than the media. An under-reported recent survey from PredictWise/Pollfish Poll finds that he New York Times and Washington Post has become a "safe space" for Clinton voters, a place to go to see all the Trump bashing they can handle, with Trump voters distrusting both those outlets far more than Clinton voters distrust Fox News. Media gets interesting with massive polarization over New York Times, Washington Post, and Fox News. 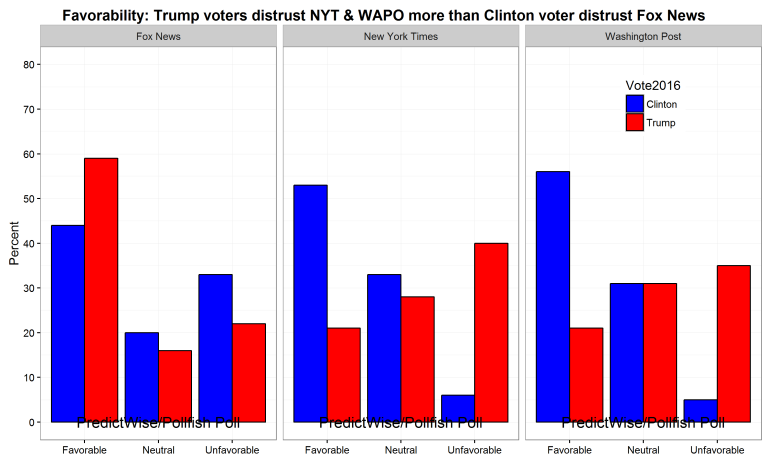 The New York Times and Washington Post both have high favorability from Clinton voters: +47 and +50 respectively, and low favorability among Trump voters: -19 and -14 respectively. But, Fox News is not equal and opposite. Slightly lower favorability among Trump voters with +37 and actually +11 from Clinton voters. That goes a long way towards explaining how the NYT managed to have 31 anti-Trump articles in a single issue and the constant Trump bashing that can be seen every single day on the front page of Washington Post's home website page. Lest anyone think I am exaggerating, just look at the beginning of one of Wapo's most recent of breathless Trump pieces..... about his "awkward handshakes." (Peter Stevenson/The Washington Post)We know President Trump is concerned with appearances – especially when he's on television, or in front of news photographers or large crowds. We also know that President Trump is concerned with hands – how large they are, how strong they are – just look at them! Whether it's just habit, or a way of asserting his power, Trump has a habit of pulling forcefully on the hand he's shaking. Trump even took time out to compliment Abe's "strong hands" – or maybe he was just referencing his own. 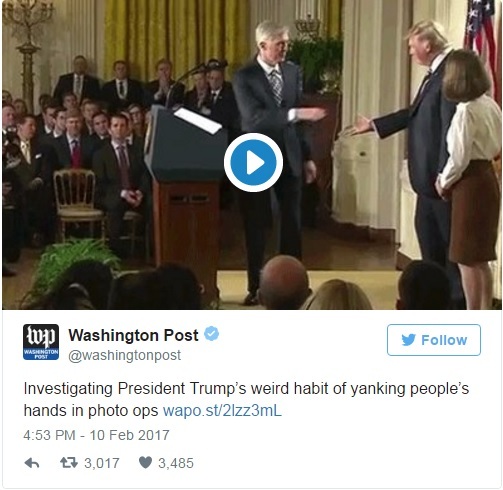 Yes ladies and gentlemen, Trump's handshake, according to Wapo, is now worthy of headline news. That isn't The Onion, or any other satire site, it is a major mainstream media source where Clinton voters, Democrats, and progressive liberals, go to get their "safe space" news. If all their antics were as amusing as the example shown above, we could sit and watch in pity as they race to their "glorious suicide" as the Daily Wire dubs it, but in between their absurd fixation on Trump's hands, and hair and tweets, they are "reporting" in a manner that is instigating progressive websites to use certain buzzwords and phrases, that are increasingly dangerous, in order to control the minds of the sleeping masses that still trust them. We have already shown how they are legitimizing violence against Trump supporters, but today we see another clear example of direct attempts at mind control. It appears that to the mainstream media, law enforcement actually enforcing the law, is something the MSM is telling their readers to frown upon and to take to the streets to protest, which of course, they have. NYT headlines with "Reports of Raids Have Immigrants Bracing for Enforcement Surge," while Wapo headlines with "Federal agents conduct immigration enforcement raids in at least six states." A dog whistle, so their foaming at the mouth dwindling audience would run after the stick after being ordered to "fetch!" The predictable reaction, exactly what they were directing followers to do by reporting that law enforcement was actually doing its job (GASP! ), followed immediately, with liberal bloggers across the board screaming "Deportation Squads," and "Trump Deportation Regime," and "Deportation Force," and "massive Deportation Raids". Nevermind the fact that ICE has asserted these raids were "planned long in advance" and had nothing to do with Trump's order, that is just a side note. 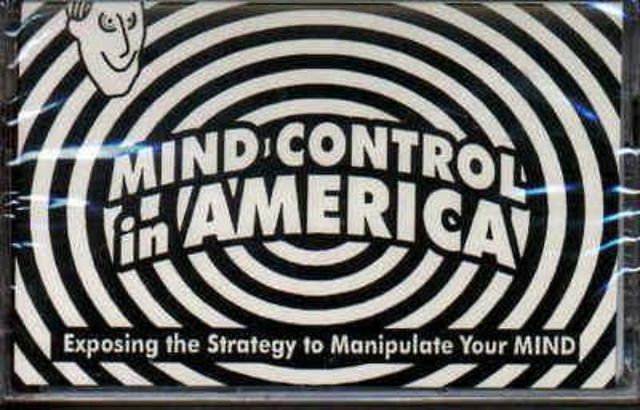 Following the predictable pattern the MSM has used their dangerous mind control methods to instigate over the last two years...... PROTESTS in the street, which was what the whole thing was meant to cause to begin with. Protests erupt in New York City and Los Angeles over immigration raids, The Week reports. 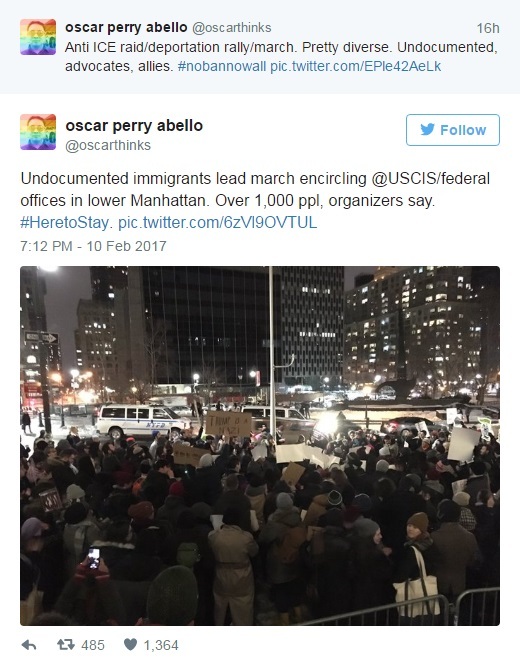 Note how they prefer the term "undocumented" rather than admitted they are people in the U.S. illegally, therefore they are illegal aliens. They are not citizens, nor law abiding because if they were law abiding, they wouldn't have broken the law by being in America ILLEGALLY! I digress.... the point being the MSM deliberately made a big deal over law enforcement doing their jobs, to incite their readers and to get progressive liberals to further incite their audience, so they could push people to protest on the street. One more note on this about the "poster child" that illegal immigration supporters are using. It’s a truly heartwarming story, isn’t it? You guys get it, right? She’s a mom. She has a daughter. She’s been in the country for 22 years trying to make a better life for her family. It’s straight out of a Hallmark movie of the week. Of course you have to sort through a lot of the associated coverage and dig down pretty far to find the pertinent details of the story. It’s true that Garcia de Rayos is a mother and has been raising her daughter in Arizona. It is also true that she has been involved with immigration law enforcement in the past without being deported. What seems to be less frequently mentioned is that she had already been found to have falsely used someone else’s Social Security number. The entire time she has been in the country, she has been living here illegally. If you, assuming you are a legal, American born citizen, were found to be committing identity theft of this type you would quickly find yourself with an appointment to see a judge. His conclusion gets right to the heart of the matter: "They could have just as easily said, "law enforcement enforces law." Still, that’s not the story you’re going to be seeing on CNN nor in the pages of the Washington Post. It’s all about the horrible, uncaring nature of the new president and his hateful policies. There was a time in this country when reporting on a story about our laws being enforced would have seemed irrelevant. Sadly, it is now so remarkable as to be front page news. UPDATE - It is noteworthy that the media has increased its "fake news" since the Obama admin repealed the anti-propaganda ban in 2013, allowing U.S. propaganda to be spoon-fed to Americans. With Apple's boss Tim Cook now claiming that "fake news" is killing peoples' minds and pushing for a campaign against "phony reports," we see a concentrated effort to stifle Independent Media, while attempting to re-establish the MSM dominace, despite the fake that the majority of "fake" and misleading news has been coming from the MSM itself. Rather than attempting to claw their way back to relevance, the MSM has doubled down, some think as a way to punish the populace for ignoring them and refusing to allow them to influence their decisions in the 2016 election, and others like myself, believe it is because they are so liberally predisposed and angry that Trump was elected over their favored candidate, that they would rather see blood in the streets of America over the next four years, than a nation healing. In their constant attempts to paint President Trump as "dangerous," they themselves have become the single most dangerous institution in America. In the news clip below, we hear from an ICE, Field Office Director, that states that 151 of the 160 illegal immigrants arrested had criminal histories, and that about 75 percent had felony convictions and the others had misdemeanor convictions.